Rocky Mountain PBS appreciates the thousands of friends who love public broadcasting. Some of our friends are quite famous! One such friend was former President Gerald R. Ford who was a member of KRMA, Channel Six, now known as Rocky Mountain PBS. 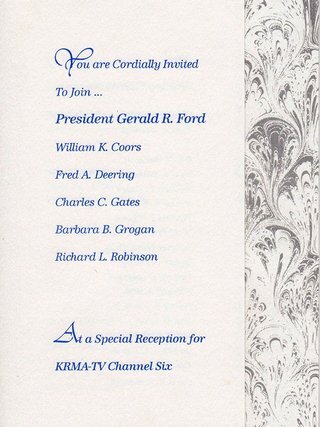 Needing a huge "kick off" to the 1992 KRMA Capital Campaign to raise $14,800,000, Don Johnson (former KRMA General Manager) made arrangements for President Ford to host a reception to announce the campaign. 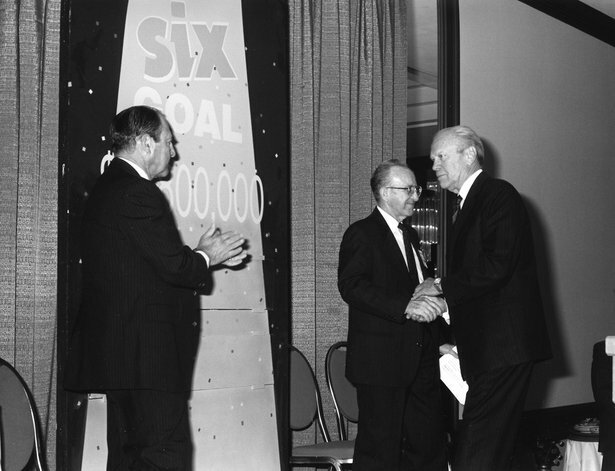 President Ford was well-known for his staunch support of public broadcasting. This milestone event in the history of Rocky Mountain PBS was held on Wednesday, July 22, 1992 at the Stouffer Concourse Hotel at 3801 Quebec Street. Over 200 community leaders joined former President Ford, Don Johnson (KRMA General Manager), Fred Deering (Capital Campaign chair) and the Capital Campaign Steering Committee. There was both local and national press coverage for the reception. 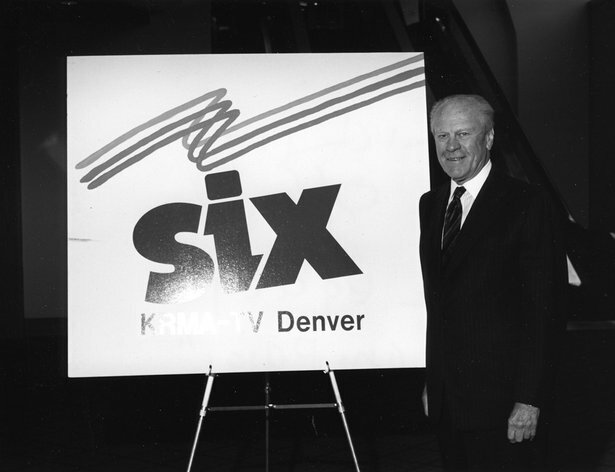 Held over twenty years ago, the KRMA capital campaign provided funds to pay for acquisition, expansion and renovation of the current studios of Rocky Mountain PBS at 1089 Bannock, Denver. In addition, the moneys raised were used for capital costs for the 1992 expansion, equipment and improvement of KRMA's production and transmission throughout Colorado and the West. During his remarks, President Ford said, "Over the years I've had a few opportunities to try to raise this kind of money ($14.8 million), so I understand and appreciate how important it is to get not only viewer support, but corporate, foundation and other support. I think it is a good investment for Denver which is a growing city, for the state of Colorado which is equally successful and growing. It's important for you to have a public television facility such as Channel Six in this community and this state." Following his comments, President Ford took the time to shake the hand of every guest. It was a very impressive event that left lasting memories for every person that attended. 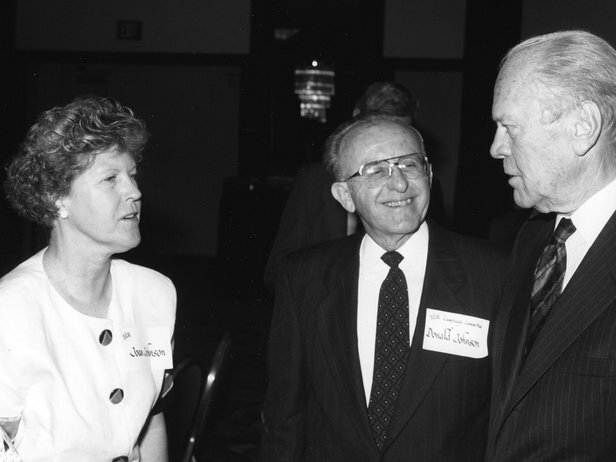 Rocky Mountain PBS has always been proud of its friendship with former President Gerald R. Ford. We want to take this moment in our history to recognize the important role of President Ford in making it possible for Rocky Mountain PBS' continued success. Photographs and research information courtesy of Station's Archived Memories, a volunteer-driven project of Rocky Mountain PBS since 2000.